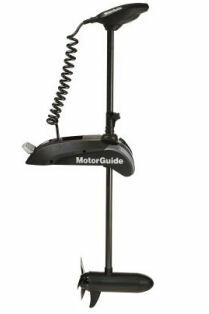 The MotorGuide Xi5 80 Bow-Mount Trolling Motor with Pinpoint GPS uses an ultraprecise GPS receiver and precision-control algorithms for incredibly accurate performance. A compact, easy-to-use remote controls the Pinpoint features, including an anchor that holds at a fixed GPS coordinate, heading lock for a specific compass heading and route recording and playback. The Xi5 80 is quiet and rigid for fishability that you can operate from anywhere in the boat. Durable electronics are 50% more efficient and run cooler while they capture and store energy that would've been lost as heat. Pro-style, heel-toe pedal operation quickly becomes second nature, letting you focus on catching fish. Digital, variable speed control has stunning low-speed trolling capability, increasing run time. The low-profile base is constructed of anodized aluminum to prevent corrosion. Status indicators placed in a highly visible area communicate power levels and motor settings. The stow-and-deploy mechanism guides and aligns the motor into a locked resting position, then shuts off the power to save battery life for longer time on the water. Linkage and hardware components are stainless steel for added toughness. The state-of-the-art steering transmission is sealed to keep out water and debris while the ball bearings reduce friction and wear for quiet and dependable performance. Motor electronics are coated and enclosed for total water and dust resistance. The composite shaft is brutally tough, bending under extreme pressure and resisting breaking. A protection circuit in the lower unit prevents damage if the prop is stalled. Composite shaft comes with a manufacturer's lifetime warranty. 80 lbs. of thrust have plenty of power to keep you in control of the boat.